There have been hundreds of ‘oops’ moment captured on live TV. There has also been epic anchor fails where TV journos are caught unaware. Joining in the long list of mistimed recordings is NBC news reporter, a US war correspondent Matt Bradley who was caught styling his hair with spit! The cringy and profoundly icky moment came when MSNBC anchor Ali Velshi was introducing him while asking about the ongoing hostilities in Syria, where Bradley is stationed. However, Bradley seemed to be engrossed in slicking back his hair. But we must total warn you about this viral video - this will gross you out! In the video footage, which has now gone crazy viral shows Velshi asking his partner, “Matt, what’s the situation for you?” Unfortunately for the pair, Bradley is unaware that he is already on live television. He is totally engaged in getting his hair in place with an easily available hair product “HIS SPIT”. Bradley spat several times and used it smoothen his hair. 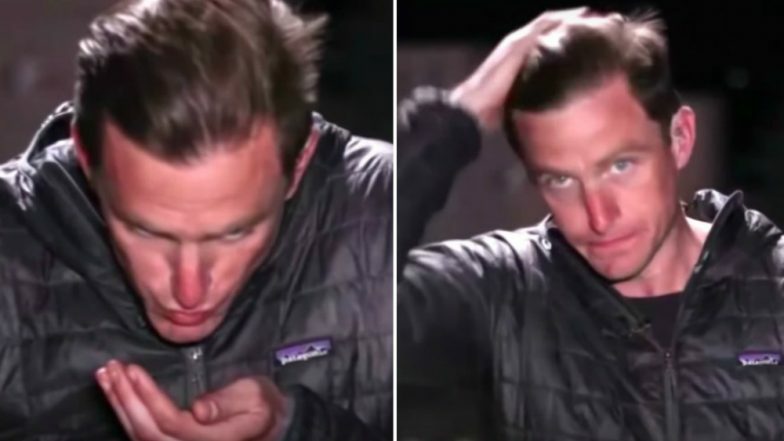 The cringe-worthy moment does not end here as Bradley is then heard asking his camera crew if his hair looks better now with spit on! He asks, “Good? Alright? Better?” It is here when Velshi sitting in the media room decides to cut off the highly gross visuals by saying, Alright, we’ve got, we do not have Matt. We will come back to him when we get him.” But by now hundreds of people have seen and trying very hard to unsee it. And like always Twitterati had a field day poking fun at this funny-icky-gross-hilarious newsroom fail moment. Here check out some of the tweets on the epic fail. A few years ago, a video of an Indian anchor combing her hair while the camera started rolling had gone viral. While it became a talking point back in the day, it was not a stomach-churning clip like the one we saw above. But Matt has found several sympathisers as well who are fine with his spit-using technique. After all, it's not easy being a war correspondent and reporting from brazen lands for weeks and months.